Yoko Ono was exposed to music early in her life and started performing at “happenings” of various avant-garde kinds in the ’50s. She was an early follower of John Cage, figured into the post-Dada ’60s art movement known as Fluxus, and started a relationship with John Lennon after meeting him at a gallery in London in 1966. Ono made much music with Lennon, including experimental Beatles material like the tape-collage piece “Revolution 9” (from The White Album) and various noisy exercises under the name Plastic Ono Band. Lennon put out a Plastic Ono Band album in 1970, and so did Ono—each with almost identical covers, but diverging sounds. (Ono’s was a scream-intensive exorcism of a record featuring lots of free jazz and feedback, among other things.) Now, at 76, Ono has resurrected the Plastic Ono Band name for Between My Head And The Sky, a striking (and comparatively approachable) new album made with help from her son Sean Lennon, as well as characters like the Japanese electronic artist Cornelius and storied New York jazz man Daniel Carter. The A.V. Club talked to Ono, on the phone from her home on the Upper West Side, about the simplicity of breathing, John Lennon’s pianos, and the controversy of art. The A.V. Club: What is the significance for you, this long after its first use, in reviving the name and the idea of the Plastic Ono Band? 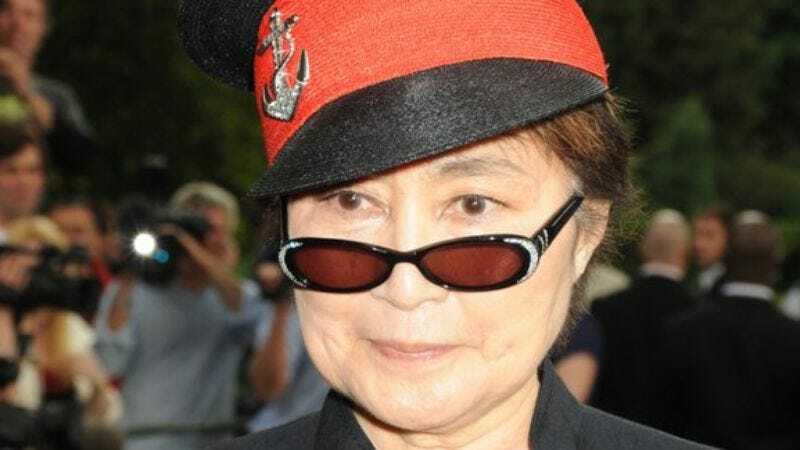 Yoko Ono: It wasn’t my idea at first. People said, “Would you please call it Yoko Ono Plastic Ono Band?” I realized that the first Yoko Ono Plastic Ono Band was a very revolutionary LP. I actually was thinking of breaking the sound barrier with it. And this, which I would call the second Plastic Ono Band, is equally kind of breaking the tradition, in a very different way. So I thought I might as well call it Plastic Ono Band. AVC: How do you feel like this one was breaking the more current tradition? YO: It’s less breaking the sound barrier and more breaking the very format of the LP or CD. In the sense that most people would try to make an album by editing and sanitizing it so that say, if it’s a classical music album, they just make a classical music album. Anything else, they just sort of edit out. In real life, you hear classical music, and then suddenly you hear jingles. That’s real life. We’re making it boring by sanitizing it. I love this hodgepodge-ness that I managed to make this time. It was always a little bit hodgepodge in my LPs, but this is really pushing it. AVC: How often do you either play or make music on your own, if you’re not working on a specific album? YO: The only instrument I can play is piano. Whenever I make songs at home, I play the piano and make them on the piano. I do play the piano when—it just sort of calms me down. AVC: Do you have a piano at the ready where you live? YO: Well, because this is an apartment that John and I shared… It was John’s tradition. I mean, every room, almost every room, has a piano. AVC: How many pianos do you have in there? YO: Well… one, two, three, four, five—five maybe. AVC: Are they all pianos that have been there since John lived there? YO: Yes. Well, there’s one that is now in John Lennon: The New York City Years [a show at the Rock & Roll Hall Of Fame Annex, on NYC’s Mercert Street]. So that’s not here now. That was the one in our bedroom, on John’s side of the bed. He would just jump up whenever he thought of anything. Even in the middle of the night, he would play. AVC: You’ve long worked in a number of different mediums. What does music allow you to communicate or tap into that is different from other media? What do you turn to music for? YO: Music is like my security blanket. The first medium that I learned was music. When I was 4 years old, my mother put me into an early music-education school. That’s where they taught you perfect pitch and harmony and how to write music and all that. At that time, one of the homeworks was to listen to all the sounds and the noise of a day and transfer that into musical notes. My mind, my ears were trained to listen to sounds. AVC: Some of your work focuses on very simple, straightforward messages; other work is much more mysterious. Is music for you, at this point, better for simple messages, or more complicated ones? YO: I think something that’s very important for us to communicate is usually very simple. Like breathing: Breathing is very simple. You don’t do a dissonant 9th harmony or something in breathing. You just breathe, you know? I think that’s how it is with very important messages. AVC: But some of your work has been complicated, especially early in your career. Have you simplified what you’re trying to get across over time? YO: It’s probably the fact that I started to notice that simpleness is divine. I think we all start trying to use very complex harmonies and rhythms and all that because of a certain kind of ambition. But I was always trying to create something simple, I think. I hope. AVC: What has surprised you, at your age, about the way you commune with art now? What would have surprised the 25-year-old you about how you feel about your work now, so many years into your career? YO: It’s a question about attitude. Some people get medals and awards and all that, and maybe not intentionally—maybe the world is making them do it—but they sort of just follow what they were doing. Repeat or follow what they were doing all their lives, in their style of music or whatever. In my case, I always try to start from scratch. It’s very nerve-racking, actually, but it’s interesting. AVC: In what way did you start from scratch on this latest album? AVC: Some of your music has had a very active social quality. Do you go out and see music these days, or get to interact with it actively? YO: For me to do everything I’m doing, I have to be pretty inclusive. I have to be pretty much inside of me rather than going out and finding out what people are doing. I don’t have the time to. I just listen to my mind, in a way. Of course my mind is exposed and also getting things that are outside, but on a kind of peripheral level. AVC: Do you miss going out and seeing what other people are doing? Or are you more content making your own work at this point? YO: Well, I was never like that. I was always inside of me, in a way. Sometimes I have compared myself with a scientist or something—when you discover something and you don’t expect the whole world to understand it. I always thought I was doing that kind of activity, in art and in music too. And I really feel that artists or musicians are controversial people. Controversy is part of the nature of art and creativity. If people are not doing that, they’re not artists—they’re artisans. AVC: Are your expectations for the art you make different now than they were when you started? YO: It was always the same. When you go on a stage, before you go on, you’re really frightened. You don’t know what to do. “Why did I say yes to this?” But once you’re on the stage, you think, “Okay.” It’s like that. Every time I create something, just before that, there’s a kind of—you’re feeling very low, you’re feeling very down and insecure. Then you create, and it’s fine. This is the way I observe me doing it. AVC: Those feelings of nervousness, do they remain as intense now? YO: The intensity’s different, but it’s a releasing of your emotions, you know? It’s like before you turn the faucet on, you’re stuck with all this emotion and inspiration and everything in your head. Once you turn the faucet, then all the water comes out and it’s good.